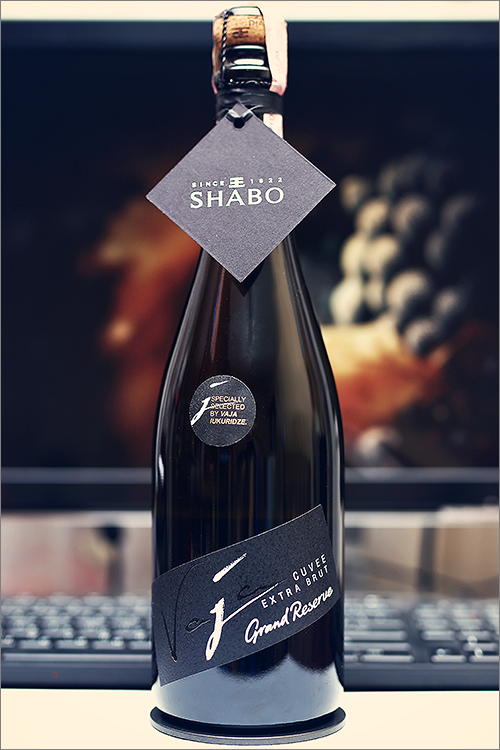 Tonight we present you one of the best crémant wines from Ukraine – Grand Reserve Cuvée Extra Brut 2014 from Shabo. It is made in a classic ‘méthode traditionelle’ or ‘méthode champenoise’ style, using two of the three three main grape varieties allowed in the Champagne region: chardonnay and pinot noir. The wine undergoes the second fermentation in the bottle and, as a result, it has been aged on the lees for 3 years in order to enrich its flavour, texture and complexity. But enough theory, let’s get straight to the tasting and find out just how good this wine really is. Brilliant-green yellow color with topaz-yellow shades towards the rim of the glass. The nose is strong, filled mostly with citrus and lactic flavours: baked apple, fresh baked bread, brie, camembert, ripe pear, quince, lemon, butter, ripe gooseberry, pomelo, white melon, straw grass, hay, yeats and some very subtle hints of barnyard. The wine is dry, with moderate alcohol level, high acidity and ripe tannin. It tastes buttery-creamy, yeasty and lactic, with a nuanced citrusy, bitter-crisp accent. This is a quite elegant, tart and a bit ngular wine, with nuanced acidity and a very appealing and fair overall balance. It has a medium finish and a balanced, bitter-crisp and creamy aftertaste. This is definitely a great Wine of Ukraine and the overall rating says the same, with 90.1 points scored it is right there, among the best wines we’ve tasted so far. Please click on the chart icon on the left in order to get to the wine rating page, where you can find all the wines we’ve tasted to date. Conclusion: this is definitely a wine in its peak form – buttery, fruity and well structured, with a quite smooth and supple body, maybe just a bit off balance. Drink it now, as now is the optimal time frame, or in the next 6 to 9 months, as there’s no reason for any more bottle ageing. This is a very appealing sparkling wine – refreshing, elegant and supple. We would recommend to enjoy this wine standalone, in order to explore its full flavour profile without any distractions. Alternatively, you can pair it with a salmon and quinoa salad or some blackberry, bacon and blue cheese salad, so that all the creaminess in the wine will be perfectly complemented by the fatness of the dish. Happy New Year!